London has no shortage of attractions for residents and visitors and as the nation's capital city plays host to a bewildering array of entertainment options and leisure and recreational pursuits. For those not familiar with horse racing it may come as a surprise that there is a thoroughbred racecourse situated just 16 miles from the city centre. For those who know their racing however, Kempton Park is on the top of the list of things to do when in London. The racecourse was established in 1878 and has become renowned as one of the world's greatest courses. Hosting both National Hunt and flat race fixtures, all of which are well attended and received Kempton offers all year round racing and is London's premier venue for both casual and keen racegoers. Getting there from the city is easy since the course has its very own railway station, on the Waterloo to Shepperton line, and situated within easy reach of the worl's leading business and financial centre as well as one of the great visitor destinations, Kempton Park offers unparalleled hospitality for both business and leisure guests. 2006 heralded a new age for Kempton, with the introduction of floodlights and a new track surface. The new track can certainly be said to be flat since it is made from an all weather synthetic material known as Polytrack. The surface is superb for fast racing which certainly adds to the excitement of the races whether in flat or National hunt fixtures. Horse that succeed at Kempton are fast stayers; those who can hit the pace from the off and maintain it till the finish. 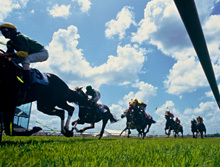 Jump racing requires the added precision required to negotiate the fences at speed. A number of hospitality packages are available to suit any size of party or event at Kempton Park. The ideal option for small groups is a restaurant package which comprises a booked table for the extent of the races within the Panoramic Bar and Restaurant, which offers incredible views over the course. The package includes admission ticket, two-course meal and any post race entertainment.